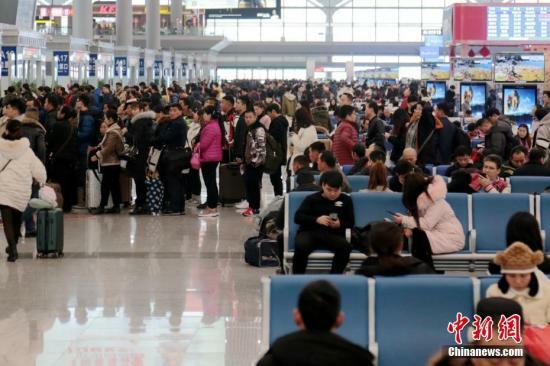 Unlike previous Spring Festival holidays during which millions of people went back to their hometowns, this year's data shows more people are rushing to big cities for family reunions. Younger migrants who left rural hometowns to work in big cities, especially those born in the 1980s and 1990s, are more likely to invite their elderly parents as well as their children to the city. Data from Ctrip and other travel service platforms shows Shanghai, Beijing, Guangzhou, Shenzhen, Hangzhou, Nanjing, Tianjin, Qingdao, Ningbo and Xiamen, all economically developed with a large number of migrant workers, as the top 10 destinations during the upcoming holiday. Ten usual migrant sources -- Chengdu, Chongqing, Harbin, Xi’an, Changchun, Zhengzhou, Changsha, Guiyang, Hefei and Wuhan -- have now become major sources of outgoing tourists during the holiday. That means for many people celebrating China’s Lunar New Year will be in cities rather than in rural hometowns like in the past. Transportation experts said Spring Festival, the most important festivity in China, is the annual peak for travel and the most difficult time to buy tickets for trips by train or plane back to hometowns. Yet air tickets to big cities, always in demand due to the mass migration, are usually relatively cheap during the travel surge, often sold at just 12 percent of the original price. An air ticket from Harbin in Heilongjiang Province to Beijing on the eve of Spring Festival now sells at 13 percent of the original prices, 126 yuan cheaper than a high-speed train ticket.